The screenplay penned by Mark and Jay Duplass is said to follow the character Jeff, a stoner who is sent on a quest by his mother. The Duplass brothers explained the film back in January as The Sword in the Stone, except with a stoner. Imdb reveals the full synopsis: When he leaves his house on a seemingly banal errand for his disgruntled mother, Jeff discovers that the universe might be sending him signals about the nature of his destiny. The breaking news reveals that Jason Segel and Ed Helms will in fact play brothers. Segel will be the stoner/loser while Helms will be a bit more settled. Their mother is yet to be cast and actress Judy Greer Love Happens is in negotiations to play Ed Helms wife. "Jeff Who Lives at Home" will begin shooting next month in Louisiana and is set to release early in 2011 if not by the end of this year. I am a big fan of both Jason Segel and Ed Helms, so its easy to guess that I am excited by this news. The Duplass brothers having been slowly stealing my heart with each of their films and seeing them finally get some bigger play is good news as well. If your not familiar, the brothers started off very small in the mumblecore scene, but now they have begun working with some much larger names. 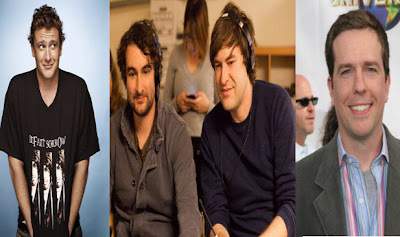 The Duplass brothers also have "Cyrus" starring John C. Riley, Jonah Hill and Marisa Tomei releasing later this year.